If you fail to make monthly mortgage payments and can’t take advantage of loan refinancing, loan modification and other options then your house can go into foreclosure. There has been a lot of talk about foreclosure and its negative consequences. The worst thing that can happen if your house goes into foreclosure is that you’ll lose your property. Another important thing that you need to be aware of is that foreclosure negatively affects home buyer’s credit score. So, you are likely to find it hard to get a loan from banks and lenders to purchase property the next time if your house has gone into foreclosure. Obviously, home buyers should do everything they can to avoid foreclosure. You should know that a house goes for auction before it goes into foreclosure. Actually, selling a house at auction is the last stage of the foreclosure process. 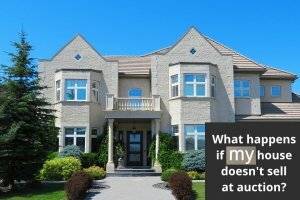 The big question is – what happens if a house doesn’t sell at the foreclosure auction? In this blog, we’ll help you find out the correct answer to this important question. First and foremost, we’ll explain to you why your house doesn’t sell at auction. In addition, we’ll give you tips for selling your house at auction. It’s clear that home buyers need to do every single thing possible to sell their property fast and avoid foreclosure. But what needs to be done if your house doesn’t sell at auction? The first step you need to take towards solving a problem is to get an understanding of why your home doesn’t sell at auction. Then, depending on the situation you’ll be able to come up with the most appropriate solution. Actually, homes don’t sell at foreclosure auction for a number of reasons. Oftentimes, properties don’t sell at foreclosure auction fast for the reason they are located in a hard hit area. A house in bad condition may also not sell at auction quickly. Obviously, properties of this type require a lot of repairs. On way or another, you shouldn’t wait until your house goes into foreclosure. So, your job is to search for a home buyer and don’t allow to a foreclosure happen. – Start searching for a home buyer as soon as possible. You shouldn’t wait for a long time if you find yourself in a situation when your home can go into a foreclosure. Don’t let this happen! The best thing that you can do is to start searching for a home buyer ahead of time. You shouldn’t wait until your house goes for a foreclosure auction. The sooner you start search for a home buyer – the better chance that you sell your property and avoid a foreclosure is. So, if you find it hard to make monthly mortgage payments and a lender can’t advise you upon the appropriate solution then you should definitely start searching for a home buyer immediately. – Ask real estate agents for help. Selling properties is the job that a realtor does every single day. So, it makes a lot of sense for you to contact real estate agents who work in your area. Real estate agencies have large databases of customers which are constantly updated. So, an experienced realtor may help you sell your house fast and easy. As a result, you’ll be able to avoid foreclosure. – Try to sell your property to a real estate investor. Let’s assume that your house doesn’t sell at auction fast and all of your attempts to find a buyer on your own haven’t been crowned with success. What is next? Obviously, you shouldn’t panic! Keep in mind panic gets things even worse. On the other hand, you shouldn’t fall into despair! A solution exists! All that you need to do to prevent a foreclosure from happening is to try to sell your property to a real estate investor. It’s worth noting that selling a home to a real estate investor has many great benefits. It’s no surprise that real estate is a multi-billion dollar industry in the United States and many other countries all over the world. It’s fair to say that real estate investment provides great money making opportunities. That’s the reason why so many people choose to work in this profitable business. The statistics shows that the number of real estate investors is constantly growing. As the saying goes “supply creates its own demand”. In other words, real estate investing is highly competitive industry. A lot of real estate investors operate in every area. And of course, every home seller can easily benefit from this kind of situation. That means that if you contact real estate investors who are interested in purchasing properties in your region then you’ll be able to get a lot of cash offers within a short period of time. So, it’s the way to go if you would like to sell your property fast and avoid foreclosure as well as its negative consequences. Another big advantage is that the vast majority of real estate investors work very fast. The reality is that home owners usually provide their customers with cash offers within 24-48 hours. So, it will not take you too much time to sell your house to a real estate investor. It’s also important to note that real estate investors are easy to deal with. Without a doubt, you’ll find it much easier to cooperate with a real estate investor rather than with a realtor. Actually, things go easy when you try to sell a property with a real estate investor. If you choose to deal with a real estate investor you don’t need to schedule showings, receive numerous calls from realtors, etc. It goes without saying that dealing with a real estate investor will help you reduce stress and save a lot of time.